Other: First book in the Matched Trilogy. The second book, Crossed, will be published in November 2011. In Matched, we meet Cassia as she is preparing for her Match Banquet, where she will be Matched to her partner for life. The Society has carefully planned everything and controls every element in the world where she lives: the partner they will marry, how many children they will get, where they will life, what their jobs will be and even what and how much they get to eat every day. Running is not allowed outside, nor is having personal belongings. The first 200 pages of the book are about the world in which Cassia finds herself and her family. The pages mainly talk about everything that is forbidden or discouraged, after we've seen Cassia getting her Match. Her Matching process doesn't go as smoothly as the Officials want it to be: when Cassia uses the microcard on which she finds the information on her Match, she doesn't see the one she's been Matched to on her Match Banquet; she sees a different boy. This makes Cassia curious and we see how Cassia deals with this change in plan. Everything that is monitored and everything that is forbidden is carefully explained in the books and it makes the book dull and flat. There's not much going on - only minor events that don't really seem important to the plot. The last 150 pages are the pages that actually are interesting. There's something going on, but what? There are things going on that nobody can explain and when the story finally begins to take form, the story ends and we have to wait for Crossed to come out to see what happens next. To be honest, I was on the verge of giving up multiple times. I feel like I've been reading an incredibly long introduction to the story and I feel left out now that I've found out that the actual story will develop in Crossed, which will not come out until November 2011. I had difficulty relating to Cassia. She didn't really have a personality until the end of the book and even then she doesn't really show her personality. Cassia obeys the Society and does everything somewhat according to the rules, and even though we follow Cassia around in the story, I couldn't really identify myself with her. This made it even harder to get through the pages filled with endless descriptions of the things that weren't allowed. Another thing that bothered me was the description of Cassia and Ky. Cassia was clearly developing an obsession for the boy and that does not mean that she's in love with him. I didn't get the feeling that they were in love, I just got the feeling that Cassia was obsessively watching him, posessive, almost stalkerish. The bond between them just didn't seem to transfer to me as the reader while reading the words on the paper. Overall, I think the storyline is genius. 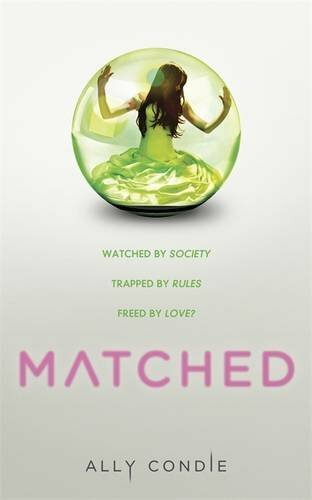 A Society Matches everyone to their perfect partner for life and Cassia struggles to obey the rules the Society created. I found the pace in the book disappointing and I truly believe that the story would have been better if we had 50 pages less of the descriptions. It would have made the book easier to read and more interesting to see the plot develop. Because I found myself bored at several points in the story. I genuinely hope that Crossed will have more pace, more action and more emotion so I can relate to Cassia. I agree about the pace. That was one of the things that majorly let it down. I think the next book will have much more action! I still enjoyed it though.